Operates on: 220 Volts DC. 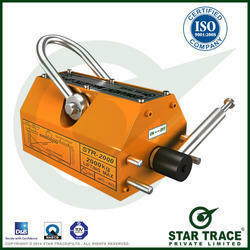 Permanent Magnetic Lifter are used for loading and unloading of material. These lifters does not require any external electric supply so no hanging wires and switches. The field of the permanent magnet is controlled by the "ON - OFF" position of the safety handle.Lifting magnets require good surface conditions to achieve maximum lifting. We offer a wide range of magnetic lifters that are known for their precision design, durability and high efficiency. These lifters are demanded for outstanding performance and are customized as per the specifications of our clients. Our range is available in various sizes and specifications at market leading prices. - e-Lift: These are powerful permanent magnetic lifters made of using Neodymium-Iron-Borom (NdFeB) permanent magnets.